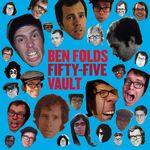 The collection of 56 historical Ben Folds tracks, the Ben Folds Fifty-Five Vault, is now live and available for download. The list includes many remastered and original songs from Ben’s collection of demo and alternate takes and material from Sony’s vaults as well. More than half the tracks are previously unreleased. The tracks can be purchased here from myplayonline.com. The complete collection costs $29.99, but individual tracks can be purchased for 99 cents each. Those who purchase Best Imitation of Myself, which goes on sale Tuesday, Oct. 11, will get a code which can be redeemed for a free five-song EP containing a sampling of the tracks available for download. The Free Folds Five EP, as it’s known, contains the tracks Dr. Yang, Narcolepsy (with Darren and Robert), and early demos of Song For the Dumped, Steven’s Last Night in Town and Underground.The idea for the collection came out of the floods that ravaged Nashville last year which destroyed many artifacts belonging to a large number of musicians, including Ben’s touring piano, which was in storage in a facility for the safekeeping of such items. Master tapes and music was also lost, but the majority of Ben’s material survived, and listening to the recovered recordings was a trip down memory lane for him. Best Imitation of Myself was the result of his efforts to get the material out for fans to enjoy, and the Fifty-Five vault of archival tracks include many that Ben felt deserved to be heard but wouldn’t fit on the retrospective disc.